Twenty-three young women from across the U.S. joined us for our Veni Si Amas discernment retreat over the weekend of October 27-29. They had a chance to pray with us and experience a taste of our religious life while meeting the sisters and opening their hearts more fully to God's will for their lives. You can view pictures from the weekend here. Our next retreat will be held March 2-4, 2018. Save the date and tell your friends! Welcome to our new Postulants! We officially welcomed the four new postulants for the year with a warm welcome reception. It was a passing over from the vocation director to our new postulant director. An exciting time for these young ladies, the community, and their families. Check out more here. Congratulations to Sr. Mariela, Sr. M. Bernadette, and Sr. M. Isabella who made their final vows! Sr. John Mary, Sr. Mary Joseph, and Sr. M. Philomena made their first profession of vows on August 2, as well. We were blessed to welcome Sr. M. Clare into the Novitiate, too. The feast of Our Lady of the Angels - St. Francis' "Portiuncula" - was a great day to celebrate with the Community, family, and friends. 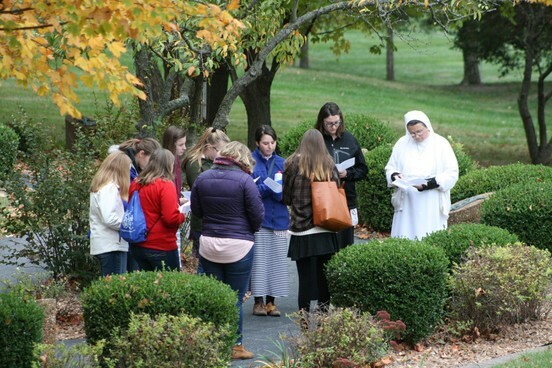 Twenty-one women from across the country gathered at St. Francis Convent in Alton, IL to encounter the love of Jesus. Responding to the invitation to ponder His Word, like Mary, these women entered into deepening their relationship with Christ. The days together included time spent with the Sisters in prayer, recreation, listening to talks, meals and sacraments. It was a joy to be with these women! Please keep them in prayer as they seek the Will of the Father for their lives. See pictures from the weekend. Joy radiated from Sister M. Christine throughout the day as she renewed her vows and asked for the grace of a jubilee. Sisters throughout the country came together to celebrate the gift of Sister M. Christine's vocation and fidelity for 50 years. Bishop Thomas John Paprocki joined us on October 10, 2015 for the occasion of the Holy Mass. Many family and friends attended to pray and rejoice with Sister M. Christine. It was a beautiful day! 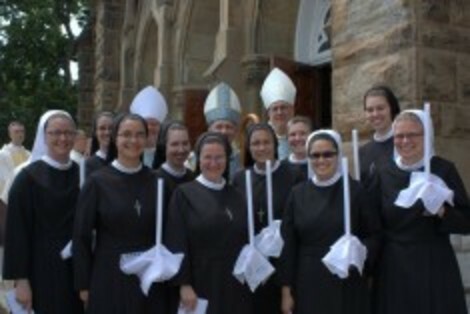 Today we welcome with great joy our new postulants to the Sisters of St. Francis of the Martyr St. George. Please pray for Gretchen, Shannon, Molly and Rachel as they begin this first step in religious life. May their parents and families be blessed for their generosity and sacrifice. 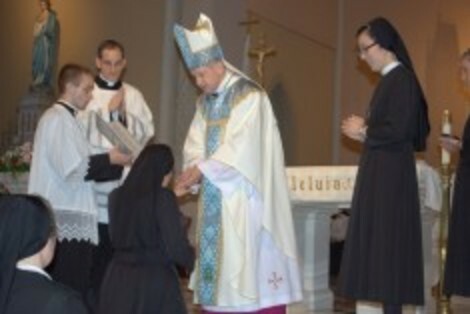 On August 14, 2015 we celebrated the Perpetual Profession of three Sisters, First Profession of four Sisters and Reception of three Novices into our community. It was truly a grace-filled day. Bishop Thomas John Paprocki, Diocese of Springfield in Illinois, was the main celebrant accompanied by Archbishop Joseph Naumann (Arcdiocese of Kansas City), Bishop Carl Kemme (Diocese of Wichita) and about 55 priests from across the nation. We are grateful for the gift of each Sister's yes to giving her life to Jesus. Please keep these Sisters in your prayers. A little past 9:00am on a Saturday morning found us welcoming Youth for Christ from St. Louis. They arrived to help us spring clean the convent for a few hours. Perhaps this is not what a typical Saturday morning looks like for a teenager, but these young men and women worked diligently alongside the Sisters. How grateful we are for their generosity! It was easy to see they have a heart for Christ to share with others. May they be blessed for their goodness. They even offered to come back any time! We'll have to see what we can come up with. ...After a beautiful day of recollection with Fr. Timothy Christy, our 19 junior professed Sisters rose early on Sunday morning. 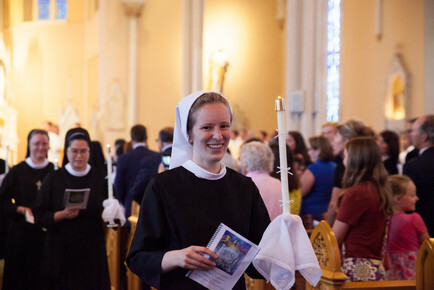 During Mass on Divine Mercy Sunday, each Sister individually renewed her profession of vows for another year. 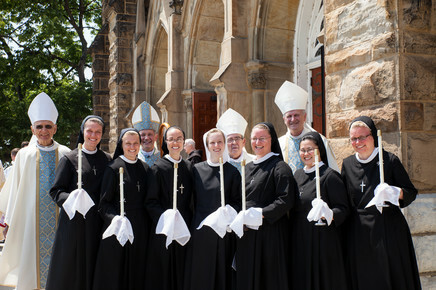 It was a joy-filled morning of grace and gratitude for the gift of these Sisters' vocations. May Jesus continue to deepen His love within them and work through them to make His merciful love visible in the world. Please keep these Sisters in your prayers! ...The weather was perfect in sunny Oklahoma, and the Sisters happened to be on Spring Break. We began early Monday morning with Mass at our local St. Mary Church. After that we had breakfast in our cars while awaiting our visit with students at Bishop Kelly High School in Tulsa. Fr. O'Brien, the high school's president, greeted us with excitement and led us into the school hallways where ALL of the students would be passing through on their way to their first class. The students were happy to see Sisters and were very friendly and welcoming. 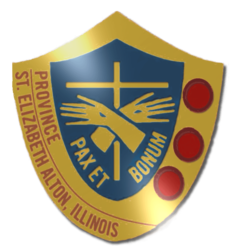 Some students know the Sisters from St. Catherine School. Sr. Maria Cordis even taught some of them when they were in 1st grade! After the first class period began we proceeded to the Theology classes to share about our vocations. Some of the classes were actually vocation classes with seniors. We had a chance to share our vocation stories and what it is like to be a Franciscan Sister of the Martyr St. George. 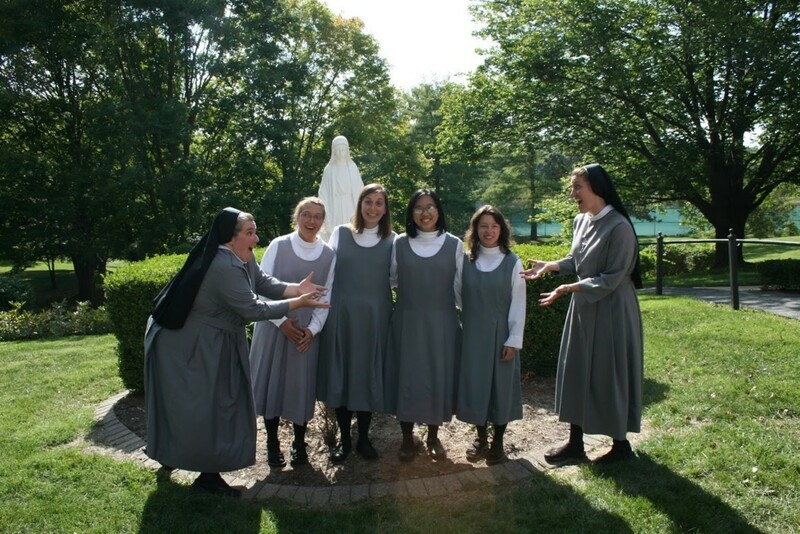 A common "thread" that each of us shared was being drawn by the joy of our Sisters as well as to our Charism which is to make Christ's merciful love visible. The students had many good questions for us. Fr. O'Brien thanked us for planting seeds in the hearts of the students. We encouraged the students to be open to building a relationship with Jesus and being open to the call and plan He has for each of them. Sr. M. Consolata had a chance to meet one on one with students both at Bishop Kelley and at the University of Tulsa (TU). In the evening we all met Sr. M. Consolata at TU. She gave an inspired talk to both the young men and women of the University. Again, the focus was much on building a relationship with Jesus which is the best "stepping stone" to discerning one's vocation. We were all able to enjoy pasta with the students and then participated in a bible study led by some FOCUS Missionaries. It was a very prayerful and reflective time leading into Adoration and ending with Benediction. On the next day, Tuesday, March 23, we joined the TU students on campus for their weekly Tuesday lunch. It was nice to have the time to just be with the students, talk, and enjoy a meal. They do not have a lot of exposure to Sisters, and so this was a good opportunity to plant seeds and help them to understand religious vocations. We all enjoyed our time together and with the students at BK and TU, and God willing, there will be some young people who respond to God's call of love through the priesthood or religious life. As the rain gently fell on a Friday evening, women arrived from various places to join us at St. Francis Convent for a discernment retreat. It was a blessed time of prayer and fellowship focusing on the theme of mercy. There were talks by several of the sisters on the topics of discernment, the vows and our charism as well as on Mary and Mercy. The women served side by side with the Sisters at our Day Care Center, enjoyed some time of silence and prayer before the Blessed Sacrament, and joined in our community prayer and meals together. We pray the Holy Spirit filled each young woman with an understanding of the depth of love the Father has for her. May she be not afraid to surrender her life to His Will. Several of our Sisters traveled to Washington DC for the annual March for Life this January 2015. Haling from Kansas, Wisconsin, Illinois, Ohio and DC itself, our Sisters joined young people on buses to support the life of unborn and to pray for many intentions. Some attended the Vigil Mass at the Basilica of the National Shrine of the Immaculate Conception while others arrived the day of the March itself later gathering with 2, 000 young people for Mass that evening. There was time to quickly see other Sisters during the March itself, for touring the sights of DC with young people, taking time to pray at the Basilica, and then traveling back home on the bus. Let us continue to intercede for the unborn, the healing of many women and men affected by abortion, and for the conversion of our country.